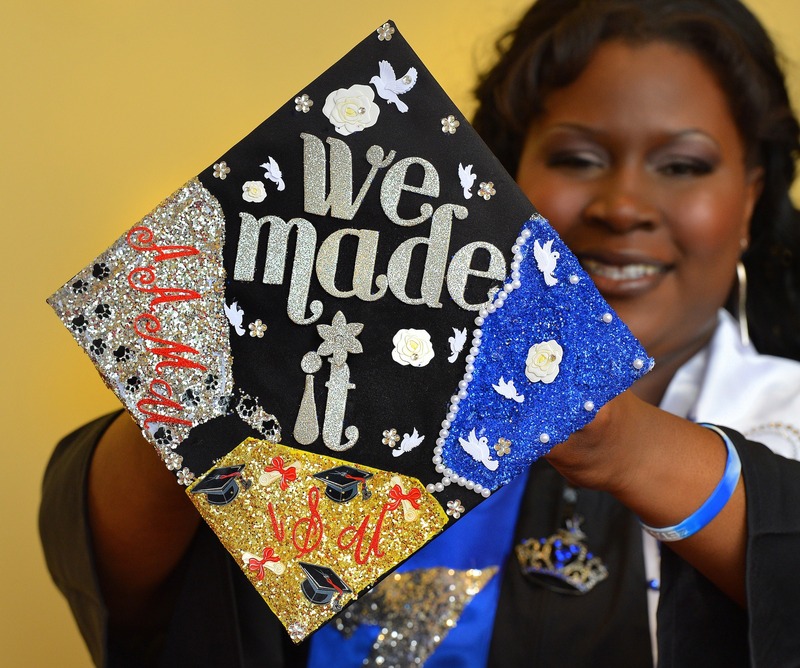 AMES, Iowa -- When Ebony Jones marches into Hilton Coliseum on Saturday, May 11, for Iowa State University's commencement, she'll be adorned in a celebratory trail of glitter that marks her journey. And hers is a journey of determination: Ebony Jones will not take 'no' for an answer. 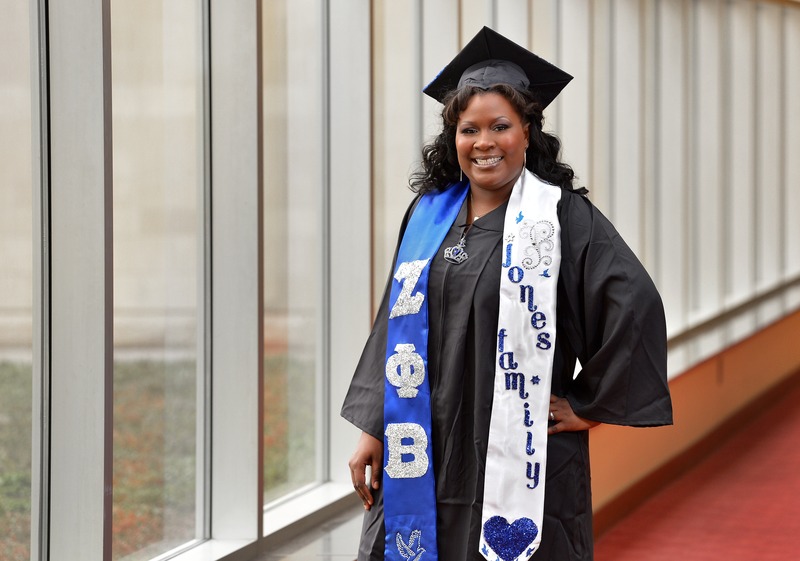 She is determined to be the first in her family to graduate from college. She is determined to overcome dyslexia and ADHD to graduate from college. Above all, she is determined to inspire others to graduate from college. Jones grew up the oldest of seven in a single-parent home in St. Louis. In middle school, she "got into some trouble" and was sent to an alternative school. "I had decent grades in high school, but I didn't think college was an option. My family didn't have the finances. They said I needed to get a job," Jones said. But her counselor thought differently. She believed Jones could succeed in college and find scholarships to pay for it. Jones' mother nixed the idea, telling her daughter they couldn't afford it. She would have to work after graduation. The parental 'no' just fueled the fire. Jones and her counselor clandestinely applied for schools and scholarships. "My counselor paid the application fees. My family didn't even know," she said. Jones found a way to attend Alabama A&M University, a historically black college in Huntsville. She chose community and regional planning as a major, preparing for a career working with youth in nonprofit community development. Jones thrived at AAMU -- achieving a GPA of 3.8. But when the scholarships ran out after two years, she applied elsewhere. Iowa State reached out. But the transition to Iowa State -- a predominantly white institution -- was not easy at first. "I talk different, I dress different," Jones said. "Coming up here from down South was like coming to a completely different world. I felt like an alien here." She recalls being referred to as a minority student soon after she arrived on campus. "I didn't know what it meant and it sounded kind of bad. It rubbed me the wrong way when I first got here," she said. And that was just the beginning of a tough year of culture shock for Jones. Both her spirit and grades plummeted. "The classwork was so much harder. I was in the same major, doing the same things, but the assignments were so much harder, so much more in depth," she said. "I felt like I was drowning. I didn't know what to do. My GPA went from a 3.8 to a 1.5. It was like I was two different students," she said. Discouraged and panicky, Jones wanted to leave school. She went to Iowa State's TRiO Student Support Services for guidance. The federal program serves low-income, first-generation students and/or students with disabilities. She talked to her academic adviser Japannah Kellogg, a TRiO coordinator. "He was the only person I could go to at first because he looked like me. It's easier to identify with someone you look like because you feel like an alien already," she said. "He got me the help I needed." Kellogg sent her to the Student Disability Resource office for testing. From there, she was referred to an off-campus doctor, who conducted a battery of tests lasting more than two days. The diagnosis was partial dyslexia and ADHD. Although medication was suggested for the ADHD, Jones chose natural options, like bedtime tea and exercise. "I don't sleep much. I can survive with two hours and not miss a beat. It's hard for me to sleep, to wind down," she said. For the challenges of dyslexia and inattention, allowances were made for Jones to have extended time to complete exams, access to class notes and a reading software program. Her books are scanned into a digital format, giving her online access so they're easier to read and highlight. And a compatible text-to-speech program can read the books to her. She points to community and regional professor Riad Mahayni, now retired, who encouraged her. "He'd say, 'You can do better than this old girl.' And I'd say, ‘OK, old man, I'll try again,'" she laughs. "I asked him why he picked on me and he said, 'Because you have so much potential.' He really pushed me to keep going and going." It all made a world of difference in Jones' life. Not only has her GPA risen to a 3.4, she's found her place at Iowa State. "I got so many friends being a TRiO student and through the Greek community. By my senior year, I kind of know everybody and everybody knows me," she said. She was elected president of her sorority (Zeta Phi Beta Inc.), and served on the National Pan-Hellenic Council. She participated in the Non-Profit Protégé Program, which gives students the opportunity to experience leadership activities in a local nonprofit. She completed the university's Certificate in Community Leadership and Public Service, and interned at the Boys and Girls Club. And Jones has spoken at the ISU Leadership Conference, the Student Support Services banquet and on the Greek Week panel. "Iowa State has given me a lot of opportunities," she said. "In each activity, I've learned something -- if not four or five things -- like how to deal with conflict, how to be a leader, how to be a better individual." Staying busy helps Jones manage her ADHD. Besides classes and activities, she works two jobs -- as a student lead in ISU Dining, and as a youth worker at Youth and Shelter Services (sometimes working night shifts full-time). "Working with the kids keeps me busy. I love working with them," she said. Jones has kept in touch with her counselor from middle school. She returns regularly to visit and speak to the at-risk girls in her former program. "I let them know that I was just like them. I was getting in trouble. I never thought I could go to college. But here I am and I'm going to graduate," she said. "I love the fact that I can inspire somebody like me." Since someone first believed in her, Ebony Jones has been determined to graduate from college so that she might inspire at-risk youth like she once was. After overcoming learning disabilities and culture shock, Jones will march into Hilton Coliseum on Saturday for Iowa State's commencement, adorned in a celebratory trail of glitter that marks her journey. "I felt like I was drowning. I didn't know what to do." Jones's cap illustrates her journey at Alabama A&M and ISU. The "we" is for family and friends "who had my back." Photo by Bob Elbert.